Whenever Ferdinand asks for a specific meal, it is invariably comfort food. Not that I have anything against comfort food, but it is not my favorite. I guess you could say I get no comfort from comfort food! What a paradox. Don’t tell anyone, but, I really don’t know how to cook. I can read a mean recipe, boy, and I can sure follow directions; I can even, make substitutions on the fly and alter a recipe to suit my own special tastes. But I do need a recipe to start from. 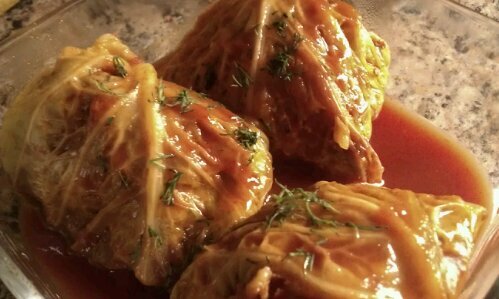 The first thing you need to do is soften the cabbage leaves to form the rolls. One way to do this is to plunge the entire head in boiling water for a few minutes. Then you take it out and peel off a few leaves. Then you plunge it back in and remove and peel off more leaves. I find this tiresome. It is also time consuming. I read somewhere that you can microwave the cabbage, but I don’t remember how. What I did was use a knife to cut some leaves off of the core. Then I microwaved them for 30 seconds. That wasn’t long enough. I was afraid the’d burn, like the Chex mix I microwaved the other day, so I ran the leaves under some cold water then microwaved them a couple of minutes until pliable. In a skillet, melt the butter over medium low heat. Add the onions and celery and sweat them until the onions start to soften and become translucent. In a bowl, combine the onions and celery, dill, cooked rice, and ground meat. Mix well and season with salt and pepper. This is the filling. To form the rolls, spoon a rounded tablespoon (more or less depending on the size of your leaves) of filling onto a cabbage leaf at the base near the stem end. Fold over the stem end over the filling, then tuck in the sides. Continue rolling to encompass filling and place seam side down in a large pot or Dutch oven. Keep making rolls until you use all the filling, stacking them. 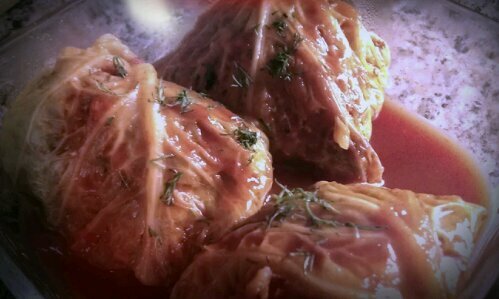 Pour enough of the tomato puree, or juice, and chicken broth over the cabbage rolls to nearly cover. Cook over medium to medium low heat, covered, to maintain a gentle simmer. Cook for an hour. 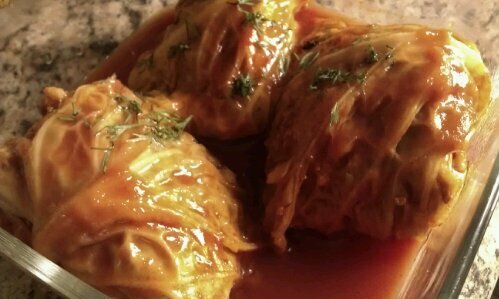 If desired, you can remove the cabbage rolls and cook the liquid down a little to thicken the sauce, but I leave it a bit on the thin side as is. I normally serve them alone, but my mother used to serve them with mashed potatoes or rice.